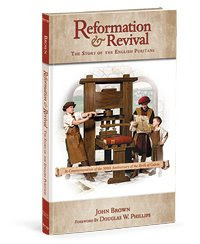 Reformation and Revival is an anniversary edition of John Brown's original work, The Story of the English Puritans (1910). Vision Forum republished this work in light of the fact that 2009 will host two big anniversaries. The first anniversary is that of the birth of church reformer John Calvin (500th). The second anniversary belongs to Charles Darwin (200 years since his birth). Two men which have wielded a great deal of influence (and continue to wield power through their written words!) on this modern age. In an effort to enlighten the modern reader as to the (positive) influence and effect that Calvin's work had on Puritans in particular, Vision Forum is sharing this book with you. This is a conservative history of Puritanism but for my part I think a conservative and positive look at this "movement" (if you will) is called for. Puritans are slammed left and right (by people who truly dislike them and people who want to distance themselves from them). The phrase "puritanical" is not a nice one, you know. In some ways this book is like a breath of fresh air and, at the very least, provides information for a more balanced perspective of the Puritans and their belief system. This book makes a great history resource. (A handy timeline is also included in the timeline to help the student make sense of the history contained therein.) If you are looking for history resources to add to your home library - consider this one.